Well your housekeeper must be good, looks like you could eat your dinner off that kitchen. 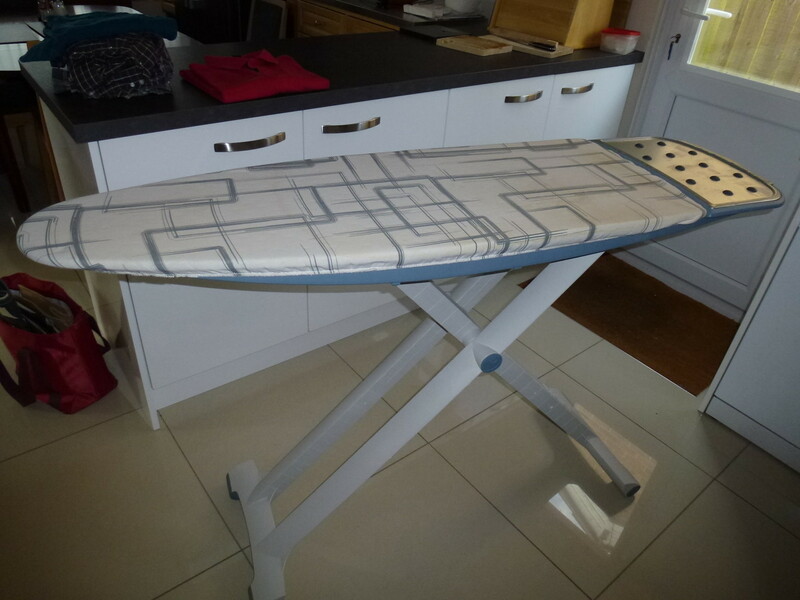 I see that is the mk3 Wilko ironing board with the rotary height adjustment tensioner as opposed to the mk2. - Nice. Can't believe you didn't post a picture as soon as you acquired it! First time I've been allowed in there! My bike went back to the dealership over Christmas to get the slow running pick up sorted. They changed split breather hose, faulty HT lead and replaced the oil saturated filters in the breather box. The breather system goes into the air box, so bad breather adversely affects the MAF sensor. Slow running is now so good it will pull 5th at idle without protest (just let go of the throttle), and pick up nicely from there, smooth. It's still a lot easier to pull the main fuse to reset the ECU than disconnect the Lambdas. Work on the other bike has shown that ECU, electronic fuel injection, really, really likes the oxygen sensors working. If you're getting better results with the Lambda disconnected then something else is probably wrong. The simple solution is usually best. (Abrasive Fluff Intake) causing premature wear. If this happens, the joint should be removed and soaked in oil for a week. I note the four feet, vital to board stability, appear to be quite narrow so I'd need to look at the tread design in order to make an informed choice, thus ensuring safe use at all times. On that basis, I would recommend caution if using after the kitchen floor has been washed: which soap should I use, I hear you cry? That's another subject which I will cover at a later date. Watch this space! Finally, the board cover design will, after a short period of use cause dizziness and should be changed immediately foe one in RED, but not just ANY red. Look what you lot have done....the housekeeper is now insisting that the wiring on the iron should be changed to oxygen free copper and kept in the freezer before use to align the molecules correctly! Didn't think they knew what a molecule was if the scrambled eggs I get served up are anything to go by. The square legs and feet would be no good for surfing either. A bit personal but I can't help it, all those on my Dad's side are like that. I blame the war. Although the cross joint is at present covered with a blue snap insert, this will eventually become loose, thus exposing the joint to AFI (Abrasive Fluff Intake) causing premature wear. It is well known that the cross joint should be stripped & packed with marine grade chip fat immediately on purchase, before you even remove the factory wrapping, otherwise the whole ironing board will be junk within a century. Not that I'd buy one of those square-framed boards - in case you didn't know Wilko haven't made an ironing board worth getting since the 1971 Special I-Lite.